Delhi’s cab drivers have finally launched their own aggregator service, and they’ve started off by taking potshots at their former employers. “Cheaper than Ula-Ober,” proclaims a promotional poster for Sewa Cab, which began operations on 19th May. Sewa Cab had been conceived of during the driver strikes which had spread across the country earlier this year. Uber and Ola drivers had been protesting the decrease in their bonuses and incentives, and had been attempting to get the companies to bring back the payment structures they’d initially signed up for. Their protests were to no avail, and Uber and Ola refused to relent. That’s when the drivers had decided to form a cab aggregator company of their own. It’s in some ways the ultimate move of defiance — starting off your own company when you’re unhappy with the terms your bosses set for you, and then taking them head on. Sewa Cab is only a week old, and is slowly finding its feet on Delhi’s crowded streets. Its app already has more than a thousand downloads, and is currently rated 4.3 on the Play Store. For an app which was built by a workers’ union and not a technology company, Sewa Cabs is pretty slick. The app requires users to sign up with their email addresses and phone numbers, and then sends an SMS OTP for verification (which it detects automatically). Its interface is very similar to Uber and Ola’s — the app detects your location on a map, and informs you if there are cabs nearby. Clicking on “ride now” gets the driver to call you and reach your location, and you give them a code to verify yourself. Once the ride starts, a fare meter calculates the fare based on the distance travelled, and payments are to be made in cash. Sewa Cabs has two variants — Eeco, which costs Rs. 5/km, and Alpha, which costs Rs. 6/km. Both variants have a Rs. 40 base fare and a time charge of Rs. 1.5/minute. One crucial aspect in which Sewa differs from Uber and Ola is its “Hail and Go” feature. Sewa Cabs have prominent signage, and can also be hailed directly from the streets. The driver will enter the rider’s phone numbers into the app, and the app will display the fare at the end of the ride. Sewa says it’ll send riders an invoice when the ride is over. This should help the company build an initial userbase, and also utilize excess supply. Uber and Ola probably aren’t losing any sleep over Sewa Cab just yet, but there are signs that it could eventually become a serious competitor. 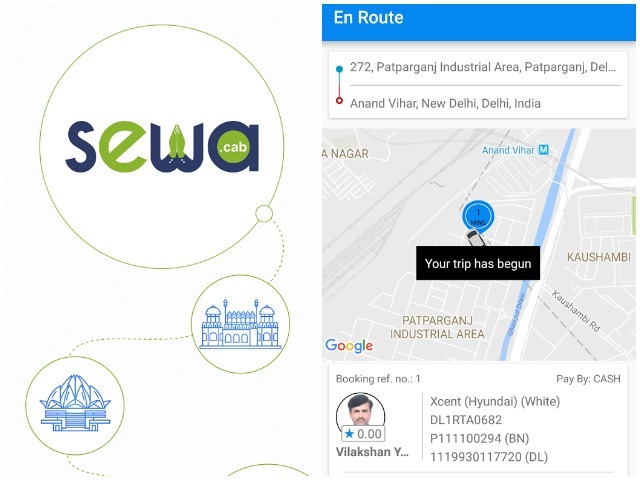 Sewa Cab had made a formal announcement of its intentions just over two months ago, and to have built an app, on-boarded drivers, and kicked off operations in that period is fairly remarkable. It helps that what seems to be driving these drivers is a deep sense of injustice — drivers feel that Uber and Ola were essentially middlemen, who were eating into their hard-earned money. Both Uber and Ola take 20-30% commissions on fares drivers earn. Sewa Cabs, being driver run, will keep less than 1% of the fares. “Whilst we firmly believe in the freedom of markets, it is necessary that the drivers are not exploited by VC-funded companies in the name of competition,” the company says. While Sewa Cab has done well to launch so quickly, teething problems do remain. It’s hard to find cabs at the moment, as several users have pointed out in its reviews. We couldn’t find a cab at our location either, but were able to eventually find some cabs by moving our location around. Several users have also pointed out that their cabs aren’t cheaper than Uber and Ola, but that’s understandable — Sewa Cab doesn’t have the VC money to subsidize its rides. Sewa Cab knows the odds are stacked against it, not only in the form of two billion dollar startups who’ll be eager to crush the young upstart, but also with keeping up with fast-changing technology and navigating India’s byzantine cab aggregator rules. But it hopes its drivers will come together and build a solid company against their former masters. It’s not going to be easy, but if Sewa Cab can become a viable business, its story will be discussed in case studies in business schools for years to come.